With mandarin-style collar, code cylinder pocket on upper left arm, rectangular pocket with a flap closure on upper right arm, and thigh pockets (upper set required, lower set optional). No visible zippers or snaps. Pants must be tucked into the boots. 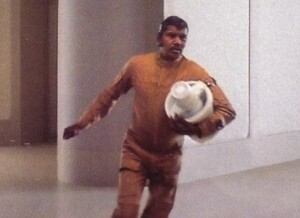 Note: The flightsuit has the same proportions and pocket configuration as the X-Wing Pilot flightsuit. X-Wing Pilot style chest pockets are acceptable. A mandarin-style collar with pointed tab is acceptable. Mid-calf black boots. (Jack boots or engineer boots are acceptable. No lace up boots. High-Calf boots are acceptable with sufficient blousing of the flight suit legs). Computer core: Old vintage motorized white or ivory colored ice cream maker (ICM) It is strongly suggested that the motor be completely removed due to its weight but at a minimum the cord must be completely hidden from view. All pieces of ICM need to be white or ivory. Core may be built from scratch. The Dimensions are as follows: Bucket: Base is just over 8” wide, 9″ tall to the top of the rim and 11 1/2″ outside diameter at the top. Motor Housing is about 4” tall above the crossbar. The Motor Housing has 20 slots in the top surrounding a circle in the middle. Crossbar is straight across. The crossbar connects at the sides by two brackets attached to the bucket. The crossbar does not extend past the bucket. There is a circular cylinder (holds the ice cream) that sits below the crossbar and extends to the bottom of the bucket. In left shoulder pocket. Two minimum, three maximum. Visible inside comm pad pocket on lower left arm. Natural hair color need to be a similar style seen on the character, specifically, ears must be exposed, hair is a men’s cut, sideburns are long but not bushy – no mutton-chops, and mustache is thin, narrow with a slight curve down at the ends. Wigs (and fake mustaches/sideburns) are permitted, but must appear natural. It is preferred that the costumer have no beard, however, a five o’clock shadow is ok, and beards if short, neatly trimmed, and that do not detract from the overall look, may be approved. Either the photo on the action figure package or the movie figure may be used for reference to hairstyle. To all Costumers: This is for the actual character Willrow Hood, not the “novelty” version. Please pay special attention to the hair style and mustache as Elvis, pompadour, and other bushy hair styles and oversized mustaches will not be approved.